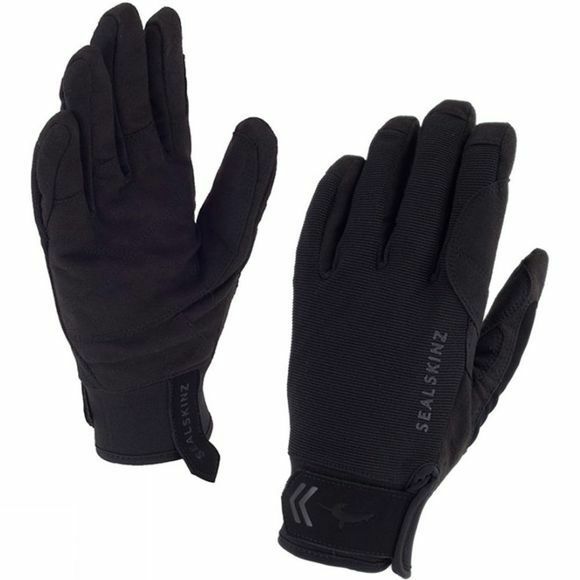 The Sealskinz Dragon Eye Glove is a low-profile, close-fitting and hard-wearing glove that offers excellent dexterity for a wide range of outdoor activities. Sealskinz' hydrophilic membrane technology is waterproof, windproof and breathable to protect you from the wettest and windiest conditions while keeping you cool at the same time. Clever construction minimises movement between the layers of the glove to improve your dexterity and to virtually eliminate the probem of the liner pulling out as you remove your hand. Pre-curved fingers and stretch fabric across the back give a close comfortable fit to aid dexterity. A suede palm provides extra comfort and increased wear resistance. A tab on the index finger lets you operate touchscreen devices with the glove on.